Will you pray for your Country? Anna Marie witnessed a most amazing vision involving Pope Benedict, this was after Pope John Paul II had already passed away and had been taken to Heaven. While Pope Benedict was still in office, Pope John Paul II came to visit his beloved and old friend. Pope John Paul II and Pope Benedict embraced each other by the arms only. Pope Benedict had his arms holding onto Pope John Paul's and Pope John Paul had his arms gripping Pope Benedict's. They were overjoyed to visit one another. Anna Marie was not privelged to know what their conversation was about, but to see them so happy in their reuniting was a great gift from the Lord. 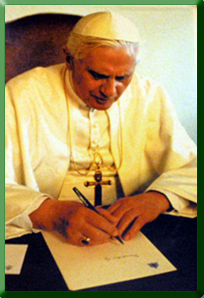 We ask that all Apostles of the Green Scapular do their best to remember Pope Benedict in their prayers as he endures his illnesses. God bless you! When Jesus asked His Apostles, "Whom do men say that the Son of Man is?" "Whom do you say that I am?" Peter answered, "Thou art Christ, the Son of the Living God." "And Jesus answering, said to him, Blessed art thou, Simon Bar-Jona: because flesh and blood hath not revealed it to thee, but My Father who is in Heaven. And I say to thee: That thou are Peter; and upon this rock I will build my church, and the gates of hell shall not prevail against it. And I will give to thee the keys of the Kingdom of Heaven." (See St. Matthew 16:13, 15, 17-19. Jesus, through divine revelation from His Father, assigned Peter the responsibility of being our first Pope. Below, that succession has continued. Catechism of the Catholic Church derives from the teachings of Jesus Christ. The information obtained from the Sacred Scriptures, ecspecially from the New Testament, has been compiled into one book called the Catechism. We have created some of the more important teachings of Jesus Christ and are presenting them in our slide show below. What are Mortal and Venial Sins?